Jeremy E. McDonald: What is Love?? Is it when our Prince or Princess comes? what is it??? What is Love?? Is it when our Prince or Princess comes? what is it??? Love does not judge and love does not restrict. We try to break love down into categories and class love into situations or types of relationships..
Love is actually very simple and it's taken me a long time to understand. I used to think love was finding a good man to settle down with and being with only him. Maybe that is a part of it or a fragment of what love is but in truth...Love is about accepting that, that man, might not always be with you and also that Love in human terms ends but love on a soulful level is eternal. So why not love your soul first and then in turn you will know how to love others as well? Through the experience of loving yourself you will attract other loving souls that are in a harmonious vibration with you and will enrich your life. What if love was a constant flow of energy of souls coming and going out of each others lives with divine purpose. What if someone leaves your life for awhile but then comes back? would that be okay? would you understand that maybe on a soulful level you both needed to be apart to grow and come back? Some of us are looking for that Soul Mate..what if we were all on some level soul mates? I mean after all we are all ONE correct? One thing that is for sure is that we are not separate on a soulful level. 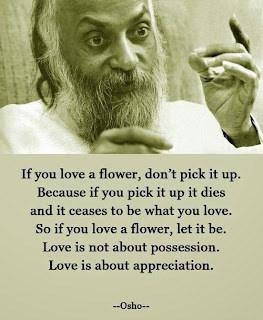 I bring this up because we tend to want to control the one we love or hold onto it like it is a possesion and make rules for it to abide by in order to stay in love in our world.